- Early this morning the newly-arrived British 10th Brigade attempts a counterattack against St. Julien in the Ypres salient. The British infantry are able to advance right up to the edge of the houses, but are halted by heavy machine-gun fire. To the east, after five hours of constant fighting, 8th Battalion of the Durham Light Infantry is forced to yield its position at Grafenstafel at 7pm, but the extra day has allowed further reinforcements to arrive, and the fall of Grafenstafel does not imperil the British line. The right wing of the German XXVII Reserve Corps is able to push forward against 2nd Canadian Brigade, but does not break through. By this evening, sufficient reinforcements have arrived to pull the battered 2nd and 3rd Canadian Brigades out of the line, replaced by elements of the Lahore Division and numerous British battalions. The British have also reestablished a continuous front from the Yser Canal east to just south of Grafenstafel. 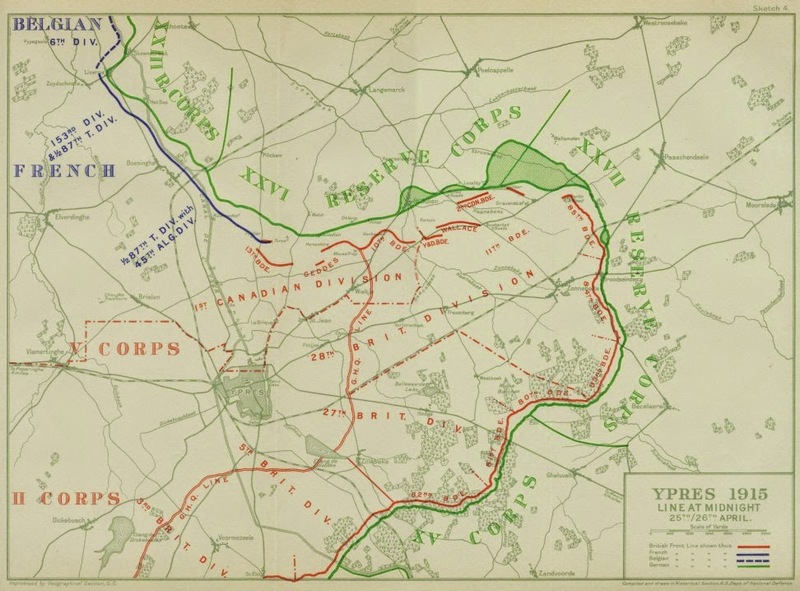 The Germans for their part recognize that the opportunity for further significant gains is slipping away; 4th Army commander issues orders this afternoon to abandon further attempts to push west of the Yser Canal as now beyond their capabilities, and instead concentration on collapsing the salient east of Ypres. The line at Ypres at midnight, April 25th, 1915. - The decline of the Austro-Hungarian army is such that an incident today shows that some of its soldiers cannot even surrender correctly. The entire 28th Regiment, composed largely of Czechs and on the Carpathian front, attempts to surrender to the Russians opposite. Instead, when they enter the 'enemy' trench announcing their surrender, they find it full of German soldiers. One can imagine the reaction of the Germans to the surrender of their allies. Afterwards, eight officers will be executed for treason and every tenth men in regiment shot to teach the others a lesson. - In the dark of night the British and ANZAC landing forces approach the Gallipoli shores, and at 1am the boats are lowered from the steamers and the soldiers begin to transfer to their landing craft. These boats are not landing craft in any sense of the word; in most cases, they are simple rowboats, which are to be towed close to the beaches by steamers or destroyers. They wait until the full moon sets just before 3am, and begin their run into shore. The Entente Landings at Gallipoli, April 25th, 1915. 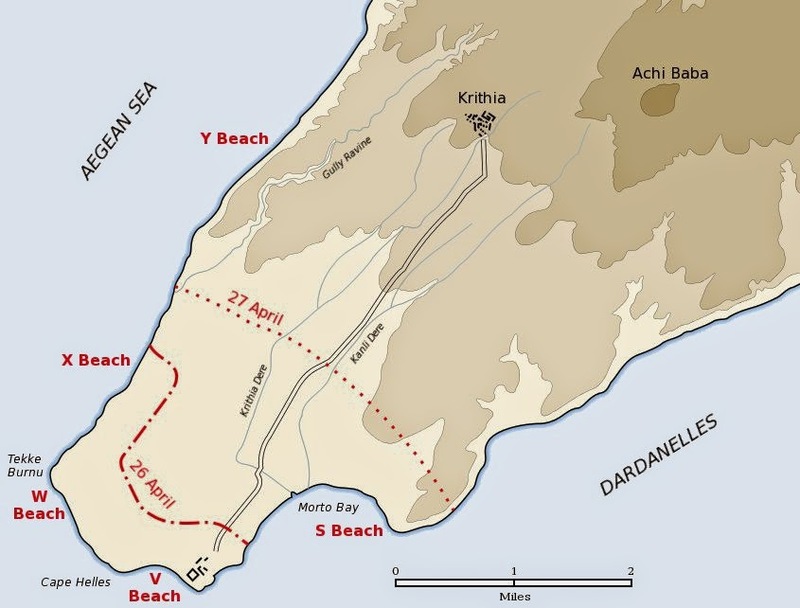 On the southern end of Gallipoli the British conduct their landings at five beaches: Y, X, W, V, and S running counterclockwise around the tip of Cape Helles. At Y, X, and S beaches, the initial landings have gone well, but the other two are nearly disastrous. At W beach, the shore is crisscrossed with barbed wire and Ottoman trenches, and the naval bombardment has not succeeded in clearly them away. When the Lancashire Fusiliers land, they take terrible casualties fighting their way up the beach. The worst, however, is at V beach. Here the British attempt an innovative means of landing two thousand infantry from the Hampshire Regiment and the Munster Fusiliers. The infantry are packed aboard the collier River Clyde, and the plan is for the ship to ground itself near the shore, at which point the soldier will pour out of several specially-cut exits in the side of the ship, make their way down gangplanks, and move ashore. In addition, eight rowboats towed by small steamers are to carry the Dublin Fusiliers to shore. When the landing is launched, it is a complete disaster. There are three complete lines of barbed wire and several Ottoman trenches and machine guns positions. When River Clyde hits bottom and the infantry begin to move out of the hull, Ottoman fire is concentrated on the exits, and fearful casualties are suffered, most never reaching shore. A similar fate befalls the men landing by boat, caught in the wire and shot down. Those who survive are pinned to the beach throughout the day, unable to make any progress. The debacle at V beach imperils the entire landing, and forces from S beach in particular attempt to push inland and dislodge the Ottoman defenders at V beach from landward, but are unable to reach their beleaguered comrades. British Landings at Cape Helles, April 25th, 1915.
of the ship and the gangway leading from them. To the north the ANZACs are landing as well. In the run into shore, the first wave had gotten lost in the pitch darkness, and a midshipman commanding one of the rowboats decides, entirely on his own responsibility, to shift northwards and the others, lacking higher direction, simply follow suit. The landing boats also bunch together, and come ashore north of their target beach near Gaba Tepe. 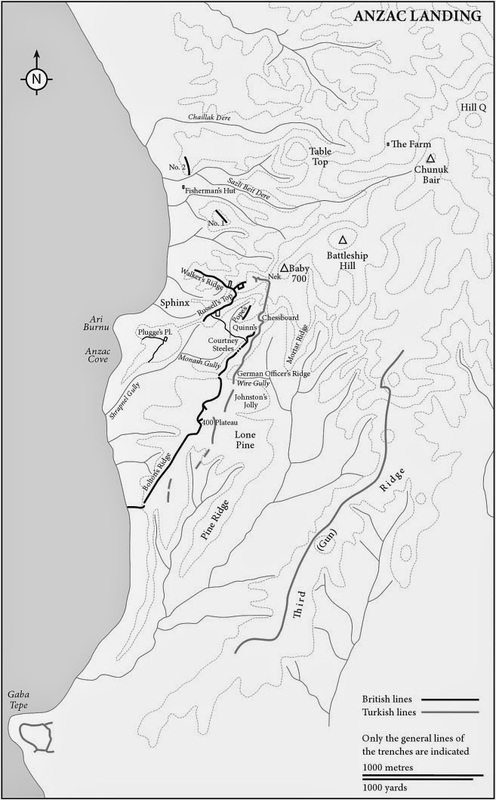 Instead, they land around the lesser point of Ari Burnu and the small cove to the south, which will shortly be rechristened Anzac Cove. The first wave hits the beach at 430am, and encounter little defensive fire from the Ottomans, the latter unable to target effectively in the darkness. The ANZACs quickly move inland, finding themselves facing steep cliffs and rough scrub which slows the advance; if they march along hilltops they are highlighted against the sky and are easy targets, whereas if they descent into the gullies and ravines they are hidden but also entirely lost. The outnumbered Ottomans, meanwhile, fall back and use the terrain to maintain an effective harassing fire. 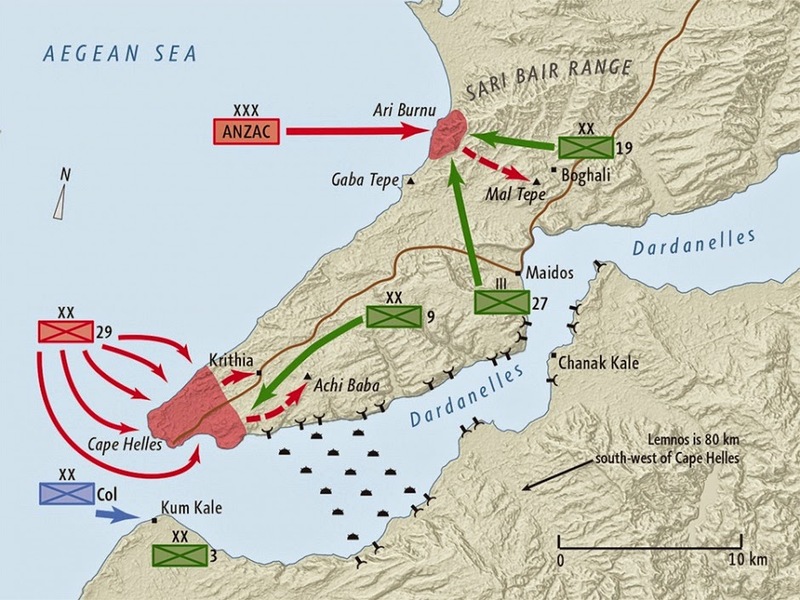 Nevertheless, the ANZACs are ashore, and despite casualties and the difficult terrain, elements are pushing inland, and by 930am a half company of 11th Battalion is reaching towards the high ground at Chunuk Bair to the northeast of the landing beach. The Anzac landing on April 25th, 1915. 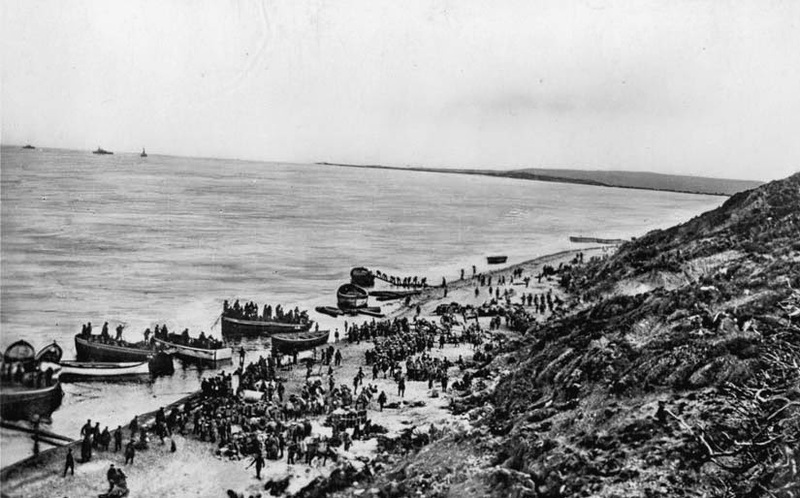 Infantry unloading on the beach at Anzac Cove, April 25th, 1915. I don't order you to attack - I order you to die. In the time that passes until we die, other troops and commanders can take our places. The disposition of Ottoman forces during the Entente landings, April 25th, 1915. On the Asiatic shore the French diversionary attack goes ashore at 930am, far too late to actually distract the Ottomans from the main landings which are already underway on Gallipoli. The French skirmish with Ottoman forces and take five hundred prisoners, but otherwise accomplish nothing of significance. 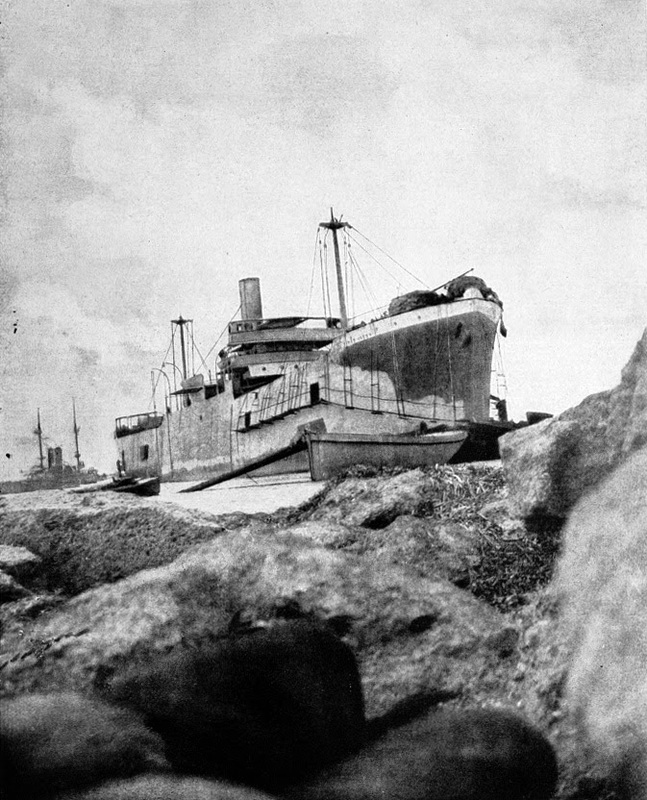 On Gallipoli itself, the British and ANZACs are ashore, but otherwise their situation is tenuous at best. At Cape Helles the failure at V beach has completely upset General Hamilton's plan; instead of pushing inward, they are still struggling to get off the beach itself. 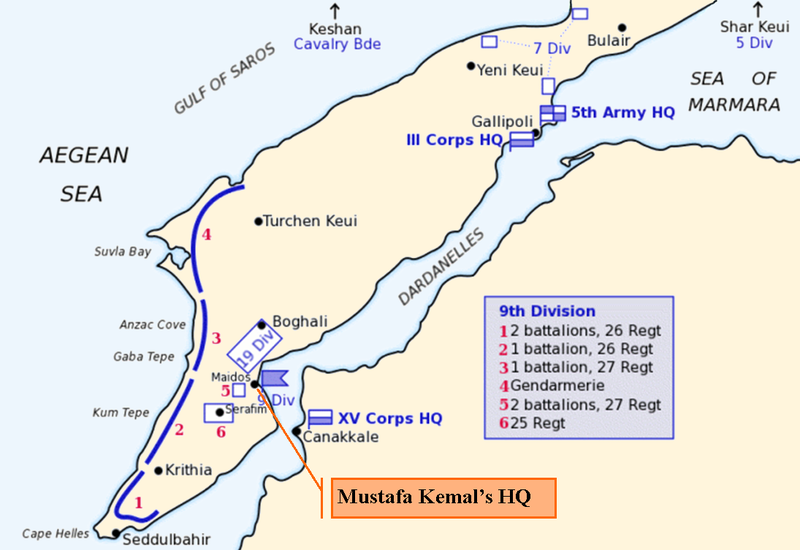 To the north, the ANZACs have been pushed back into a narrow beachhead, contained by the perfectly-timed counterattack led by Mustafa Kemal. It is only the first day and the Entente plan has gone badly off the rails. - As the British and ANZACs land and die at Gallipoli, the Russian navy decides to make an appearance, bombarding the Ottoman forts at the entrance to the Bosphorus. The attack makes no real difference, in line with the Russian contribution to the Dardanelles campaign to date. - Meanwhile, amidst growing concern over the situation in the Aegean, and increasingly frustrated with the hesitancy of the Austro-Hungarian navy, the German navy has decided to dispatch U21, an ocean-going submarine, to the Mediterranean to attack the British and French warships off the Dardanelles. As U21 does not have the range to reach the Aegean on its own, a supply ship has been been chartered from a port in northern Spain and will rendezvous with the submarine to allow it to refuel.